DPCI provided Adobe Digital Publishing Suite consulting services to facilitate the launch of McLaren Macomb’s first digital publication. Founded in 1944, McLaren Macomb is an acute care hospital located in Mount Clemens, Michigan. Today, the hospital employs more than 420 physicians and provides a full range of services from cancer to cardiovascular care. 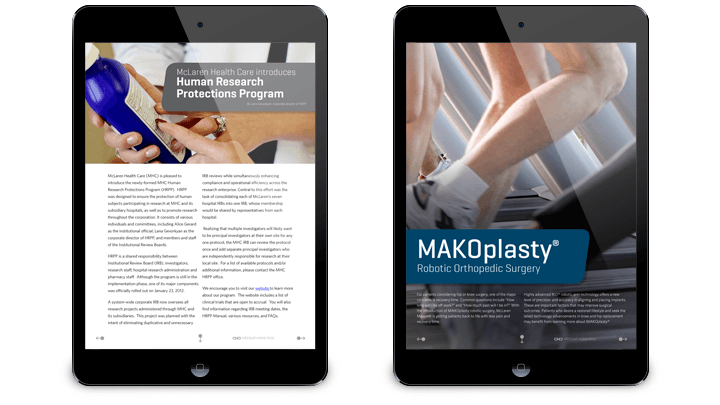 McLaren Macomb sought to provide affiliated physicians with the hospital newsletter optimized for Apple mobile and tablet devices. The McLaren Macomb administrators selected the Adobe Digital Publishing Suite (DPS) toolset for Adobe InDesign CS6 to create rich, interactive content for the newsletter. Administrators retained DPCI to provide Adobe Digital Publishing Suite consulting services to facilitate the launch of McLaren Macomb’s first digital publication. DPCI guided McLaren Macomb’s creative staff through the Adobe Digital Publishing Suite workflow from start-to-finish to ensure a smooth and timely launch. While Apple’s provisioning documentation was readily available to McLaren Macomb’s content creators, DPCI’s professional services team helped guide the way by offering Adobe Digital Publishing Suite best practices for a worry-free provisioning process for distribution in the Apple App Store. DPCI consultants assisted McLaren Macomb with the quality assurance of all assets bundled into the newsletter app in accordance with Adobe DPS and Apple specifications. In addition, DPCI guided McLaren Macomb through the common stumbling blocks encountered with the creation of role assignments and permissions for administrators, designers and users. DPCI then provided a step-by-step walkthrough for delivering the app to Apple for review and approval. 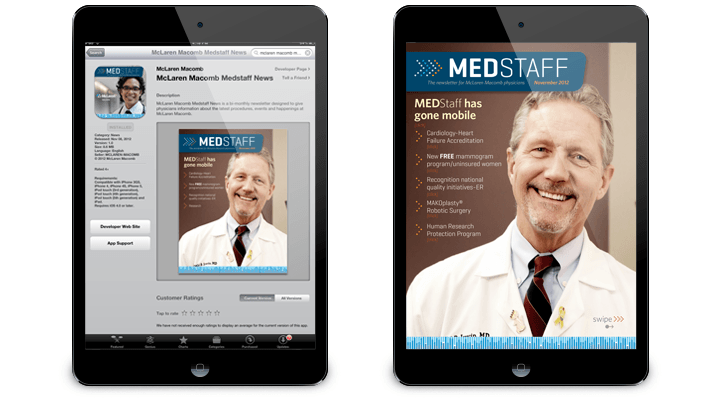 The McLaren Macomb newsletter entitled ‘Medstaff,’ successfully launched in November of 2012. 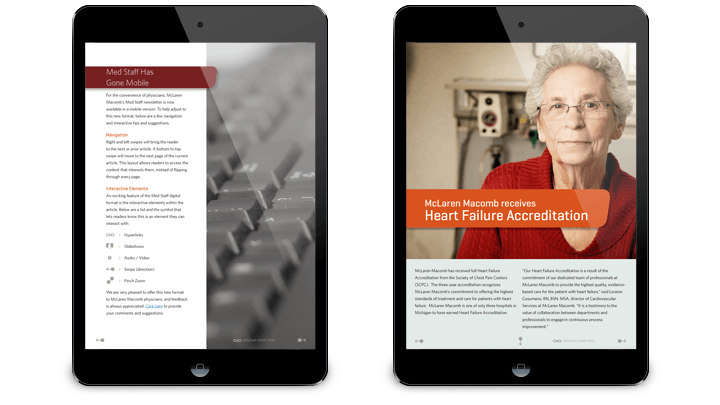 The interactive publication, created with the Adobe Digital Publishing Suite Professional Edition, is fully optimized for Apple mobile and tablet devices and provides McLaren Macomb’s physicians with internal news, medical research, recent accolades, new procedures and other developments within the organization.